Designer Hayley Elsaesser takes us behind the scenes of her latest collection "Teenage Wasteland." Fashion designer Hayley Elsaesser's clothing is an unmistakable explosion of cheeky patterns, popping colours and just the perfect amount of nostalgia. With its pastel flip-phone prints and shiny velour tracksuits, the latest collection she showed at Toronto Fashion Week in September was no exception. Her new collection "Teenage Wasteland" is a nod to her rebellious teenage years growing up in small-town Canada, and the journey that she had to take in order to become comfortable in her own skin. As she describes: "When you're a teenager, it can be really hard to want to be yourself. Sometimes it feels like you're wrong for being yourself." Elsaesser — whose fans include Lilly Singh, Katy Perry and Miley Cyrus — says that she never felt like she fit into the "typical fashion industry," which is why her choice of model is key to her vision as a designer. This notion was carried onto her sparkling showstopper of a runway with models who repped an array of sizes, shapes, gender identities, religions and races. "I want [the audience] to be like, 'Oh, that person looks like me and they look awesome. I could wear that." 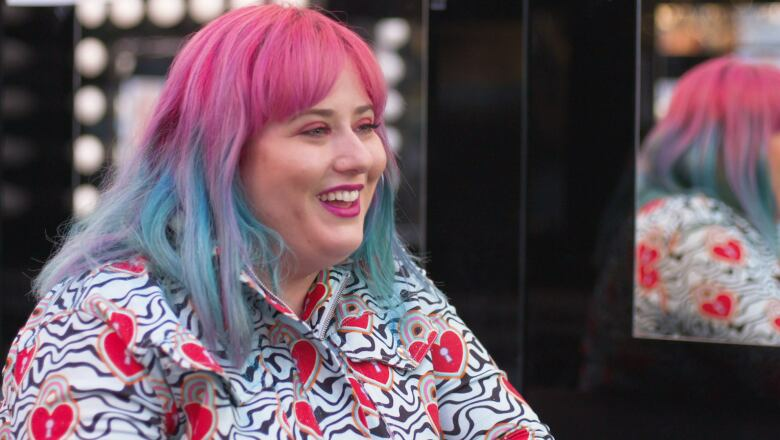 In this video, we go behind the scenes of Elsaesser's Toronto Fashion Week show to hear how she got her start, and why she wanted to create a Freaks and Geeks-inspired collection.